At IAAPA in November, Jolly Roger launched Ezee Swap, an innovative new children’s ride concept. Ezee Swap is a video simulator platform with interchangeable rides enabling operators to swap between their chosen rides and place them on a platform designed to suit their environment. The coin-operated ride is aimed at three to seven-year-old children and each ride option offers four selectable on-screen track, creating entertaining experiences that can generate repeat play. These videos are easily swapped when changing the ride by inserting a flash card and dongle. Ezee Swap is fitted with a 22ins TFT display, with the ride’s rocking and side-to-side movement following the on-screen footage. It is fully automatic and features push buttons and playful sound effects. 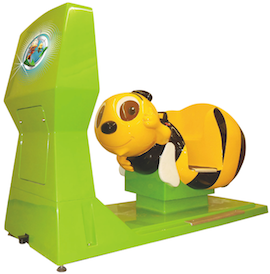 The platform ride can be fitted with a range of detachable rides, including Bumble Bee, Racing Car and Propeller Plane, with each featuring a steering wheel or grab handle.